We are still into the wind not as bad but still enough to cause people with allergies to suffer. I pretty much have the bathroom put together but still have not purchased towels or rugs. Hope to get that done tomorrow after breakfast or brunch which ever we decided to do. I did manage to get the camper set up again after everything slid down to the door. When I did this paint job it was the thing back then to give it that old look, well the old look got really old and had to go. 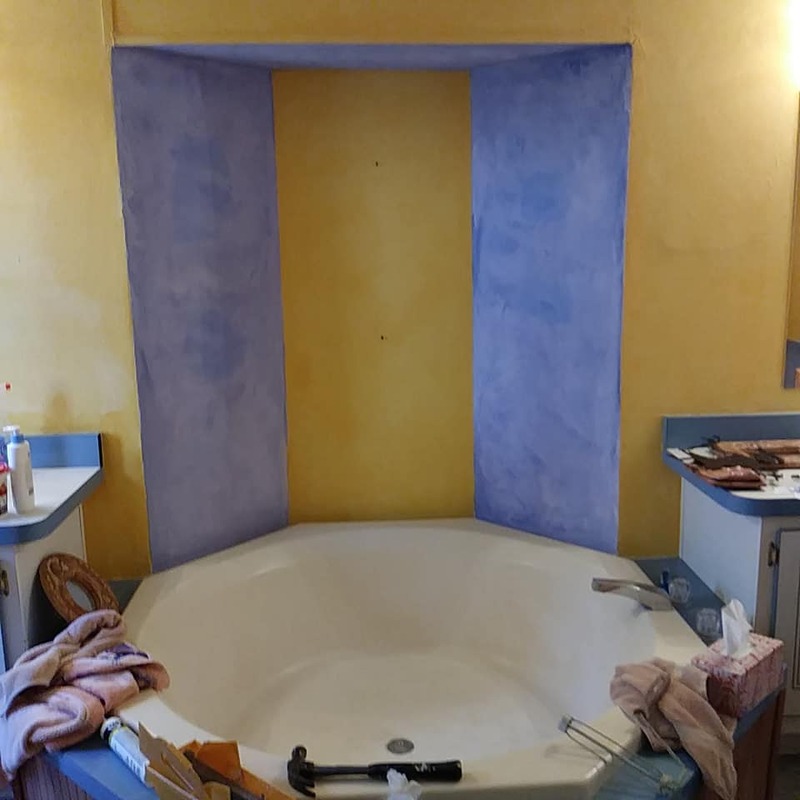 I would love to remove the tub but that would require lots of money and work. This morning when I woke we had no power it must have just happened because the ceiling fan was still turning a bit. I got ready and still no power. Went out to the shed to get the Melitta coffee filter to make coffee. I boiled up some water on the stove which had to be lit with a lighter and had a great cup of coffee. Since my Internet works off electric it was down too. But my phone has it so I checked my FB and a few other things. I didn't know how long the hot water would last so if it hadn't come back on I would have brought in my camping shower and heated some water for it. So happy I have all my camping gear to get through things. I can go out to the truck and recharge what ever needs recharging also. The electric was off for about 1 1/2hrs. I have a Melitta coffee system that I got for when I was camping. I love the coffee it makes. I also got a hand grinder for coffee beans and a one burner propane stove, which is great when traveling/camping, but will also be good to have if there is ever an extended power outage. It sounds like we are both on the same wave length! I know if I can brew a good cup of coffee or two, I can figure out what to do in any emergency situation. I have a 1 burner propane and a 1 burner butane stove. I also have a coffee maker that can sit on the stove and makes coffee like the electric ones but it is so bulky I don't know if I will ever use it or carry it around. Like you I love the coffee the Melitta makes and even though I have electric this morning I used the Melitta. I do believe us campers have a heads-up on the general population. I think I can survive on what I have learned over the years in the school of hardknocks. Yes we sure do we can make just about make anything work. 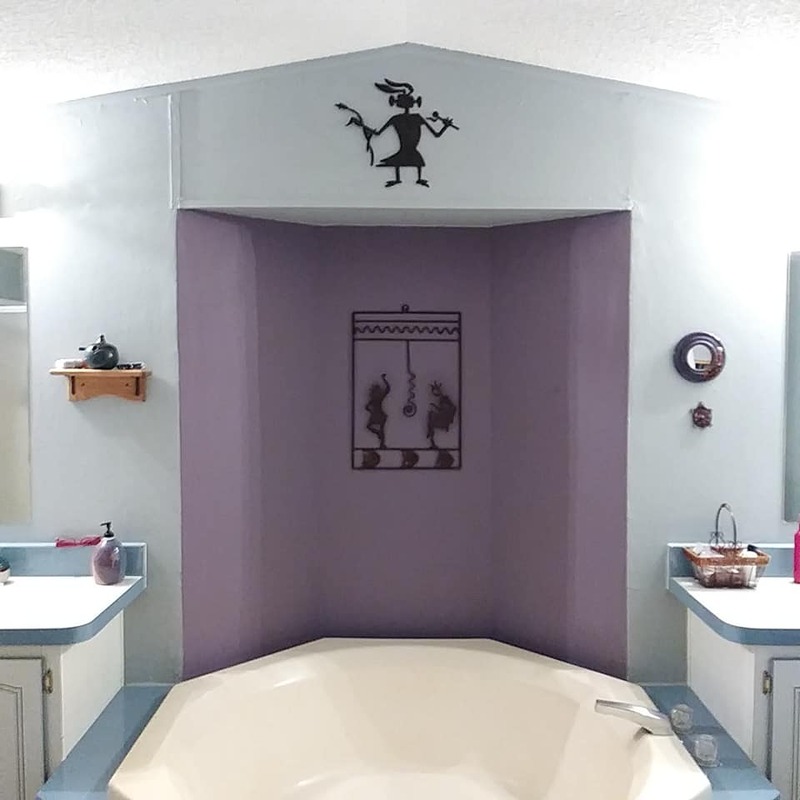 Really like the new paint job in your bathroom. Nice to be versatile, power outage for us really no problem at we are self sufficient. And we can always get by like you. Thank you the paint job was so needed. We know how to make things work with a camping background. Nice paint job in the Bathroom. Having Camping Equipment around saved us many times when we still lived in our House then Apartments. While others didn't have a clue of what to do we just did business as usual. I love my new bathroom colors so soft and calming. This camping gear is wonderful stuff to have around. It comes in very handy when power fails during the monsoon season, even the batter powered fans are a wonderful thing. Love the bathroom. And we campers definitely know how to survive in an emergency. Nice day today but more wind later. I guess it really is spring. Thank you. We sure do know how to get by don't we. Yes it looks like we may have a nice day today at least for a while getting out today and enjoying it before it gets to hot. I do love the lavender and blue combo in your bathroom, they compliment each other and it can be woven into together with accessories, even with darker shades of each of the colors. Good job. IT looks fab!! Back in the day my dad used to make a small "stove" from a coffee can and he would put twigs in it and set the old metal coffee pot on top when the power was off...I get my "tinkering" ability from him. He would LOVE the little stoves we have! The purple I feel in love with years ago at a job I had and they had painted a stair well with it, then I saw it again in an Imagining center. They didn't use the grey it was a darker beige color. I went back and forth with that but I really liked the grey. Because of the blue trim to the vanity and tub it makes the grey look blue. Thank you. Did your dad make holes in the the bottom sides of the can? I have seen it done that way. And it still is a good idea. My dad was a tinker also. I used to get into all kinds of stuff but I don't know why I quit. We used to work together on projects.